I hope you’ll support me and the Global ROS1 Initiative as we strive to accelerate research, find better treatments and hopefully cure ROS1 positive (ROS1+) cancer — which I have. Here’s a National Cancer Institute blog about the Initiative. This project is very dear to me. If you’ve been meaning to contribute, or you have friends or family you’ve been meaning to ask to donate, do it today, or sometime before the end of the year! The recently-signed US tax law revisions may affect whether you can claim a tax deduction for your charitable contributions after January 1, 2018. Thanks for supporting ROS1+ cancer research—you could help save someone’s life someday. For those who want more detail about the project and fundraiser, read on! My type of cancer is driven by an alteration in the ROS1 gene. Medical research has made it possible for me to live well with aggressive, metastatic ROS1+ lung cancer since 2011. However, ROS1+ cancer is uncommon (only 1%-2% of lung and other cancers) and not well understood. Only one approved ROS1-targeted drug exists, and patients eventually develop resistance to it. Little is known about how this disease begins, progresses and develops resistance to treatment. This fundraiser directs funds to the Bonnie J. Addario Lung Cancer Foundation (ALCF), a 501(c)(3) nonprofit (view their Guidestar page); monies are placed in an ALCF account designated for our ROS1 project. Donations are tax deductible under US tax laws. What is the Global ROS1 Initiative? I helped to create the Global ROS1 Initiative, a unique collaboration between ROS1+ patients, caregivers, researchers, clinicians, and industry. This is the first-ever effort initiated by patients to focus on cancer driven by a single genomic alteration anywhere in the body. We are initially funding projects in the US (takes time to learn about international research collaboration), but our patient group is global, with patients in 19 countries to date. How did the Global ROS1 Initiative get started? Who are the Global ROS1 Initiative partners? What research will the Global ROS1 Initiative fund? A survey conducted through Stanford University, which collects personal and health history data on ROS1ders. Researchers will study the data to look for possible causes of ROS1+ cancer, and evaluate effectiveness and sequence of treatment options. The ROS1 Cancer Model project, which is creating new models of ROS1+ cancer for drug development and research into our disease. In early 2017, only a few ROS1+ models existed, and they did not represent all the dozens of variations of ROS1+ cancer. In this project, we ROS1ders agree to donate our cancer tumor cells collected in the normal course of care to create cell lines and mouse models that researchers can use to study our disease. How will the Global ROS1 Initiative accelerate research? As part of our patient-driven approach, we aim to make our data and models widely available to the cancer research community instead of holding it in silos at individual institutions. We will be creating a biorepository of our specimens with annotated patient data, including making use of patient registries (like the Lung Cancer Registry) that share de-identified data will validated researchers. The cancer models we create will be distributed at minimal cost to researchers. The ROS1ders also help spread vetted information about ROS1+ cancers to patients, caregivers, and the public. We donate our time to maintain and write content for the ros1cancer.com website which shares up-to-date information about ROS1+ cancer, names of ROS1+ experts, known treatments and their approval status globally, and available clinical trials focused on ROS1+ cancers. We also administer a private Facebook group in which ROS1+ patients and caregivers share their experiences, news about our cancer, and tips for living with our disease (more info on joining this group is here). 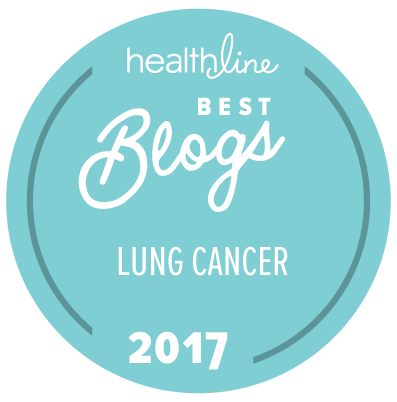 This entry was posted in Advocacy, Lung Cancer, Patient Advocacy, Patient-Driven Research, Precision Medicine, Research, ROS1 Cancer, What Matters Most. Bookmark the permalink.